Matched-waveform Audio Edits: Here's an example of the kind of mid-note slice point that can benefit from a matched-waveform edit (Ex06.03:WAV/MP3 ). At the moment the waveform is mis-aligned and without any crossfade, so you hear a big click. Sliding the waveforms fractionally to line up their repeating cycles dramatically reduces the click, even without any crossfade (Ex06.04:WAV/MP3 ). Adding a short equal-power crossfade over just a couple of waveform cycles smooths the result even further (Ex06.05:WAV/MP3 ). Although the edit is still not completely inaudible in this case while the vocal is soloed, it'll be more than good enough to pass muster when set against even the most basic backing arrangement. 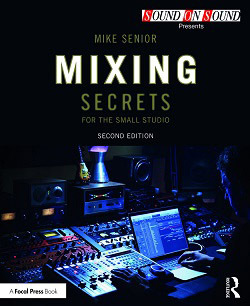 Masked Audio Edits: An often overlooked method of concealing audio edits is to hide them behind other masking events in the production, as demonstrated in the following audio examples. Here's a truly blood-curdling audio edit (Ex06.06:WAV/MP3 ), causing a big lump right in the middle of a vocal line. Now listen to that same edit within the context of the mix, and notice how the strong masking action of the drum loop's kick/hat downbeat completely conceals even such horribly clunky discontinuity in the vocal line (Ex06.07:WAV/MP3 ). Pitch Correction Side-effects: Although state-of-the-art pitch-correction engines such as Celemony Melodyne's DNA now offer enormous potential for pitch-correction, they still tend to produce unwanted processing side-effects when presented with transient, noisy, or polyphonic audio. To show what I mean, here's an out-of-tune acoustic guitar recording (Ex06.10:WAV/MP3 ), and the same file which I have corrected as carefully as I can in Celemony's Melodyne Editor (Ex06.11:WAV/MP3 ). Note the chorus-like artefacts during note sustains (particularly bad at 0:03) and the softening of the picking transients. Improving Automatic Pitch Correction: Automatic real-time pitch-correctors will usually give unmusical results with their default settings. Take this untuned vocal (Ex06.12:WAV/MP3 ), for example, and hear how GVST's GSnap plug-in responds unmusically if left with its default settings (Ex06.13:WAV/MP3 ). Using automation or MIDI data to tell GSnap what notes are being sung improves the musicality somewhat (Ex06.14:WAV/MP3 ), but it's only once the correction speed is adjusted in real time using automation (Ex06.15:WAV/MP3 ) that the correction begins to feel more transparent. Time-stretching Versus Beat-slicing For Tempo Adjustment: Although modern time-stretching algorithms can be very effective on some sounds, they tend to struggle with noisy or percussive tracks. Take this 95bpm drum loop (Ex06.18:WAV/MP3 ), for example, which I've slowed down to 85bpm with two different algorithms: the bundled Elastique 2.1 Pro routine in Cockos Reaper (Ex06.19:WAV/MP3 ) and the specialised third-party Celemony Melodyne software (Ex06.20:WAV/MP3 ). Notice in particular how the tone of the drum sustains takes on a slightly chorus-like quality in the first example, but how the amplitude envelope of each drum hit is also extended unnaturally by the processing even in the less chorus-y second example. By contrast, slicing up the loop into its component hits and crossfading over the gaps (Ex06.21:WAV/MP3 ). Timing & Pitch Correction In Context: Here's an example I did for this Mix Rescue remix which demonstrates how timing correction can subtly tighten up the sound of a mix. Here's a section of the remixed backing track, first without any timing correction (Ex06.01:WAV/MP3 ), and then with extensive timing edits to the bass and guitar parts (Ex06.02:WAV/MP3 ). This Mix Rescue project, on the other hand, illustrates the impact of tuning correction on the blend of a track. Here's a section of the remixed backing track, first without any tuning correction (Ex06.08:WAV/MP3 ), and then with extensive off-line tuning edits to the guitar and synth parts (Ex06.09:WAV/MP3 ). A final combined timing/tuning-correction example comes from this Mix Rescue, where you can compare the sound of a section of the final remix with all the corrections (Ex06.16:WAV/MP3 ) and without them (Ex06.17:WAV/MP3 ). Some Plug-in Tuners: If you can head off tuning problems at source, you can save yourself a lot of problems. Here are a couple of freeware tuner utilities in case there's nothing suitable already built into your DAW software: GVST's GTune and NDC's Tune It . Third-party Pitch/Time-manipulation Software: There are a number of well-established developers of real-time pitch/time-manipulation software, including Antares (with Auto-Tune ), Celemony (with Melodyne ), and Waves (with Tune ). Serato also have a good reputation for off-line processing with their Pitch 'N Time software, and SynchroArts VocAlign may be useful for you if you find yourself with lots of multitrack layers to synchronise. Although I use Melodyne myself (not least because of its ability to work more flexibly with polyphonic audio), any of these options will deliver professional results. If you're working on a tight budget and your DAW doesn't include real-time pitch-correction as standard, then check out GVST's freeware GSnap or G200kg's freeware Kerovee . Alternatively, try out the low-cost Cockos Reaper DAW, which includes the ReaTune plug-in as standard. 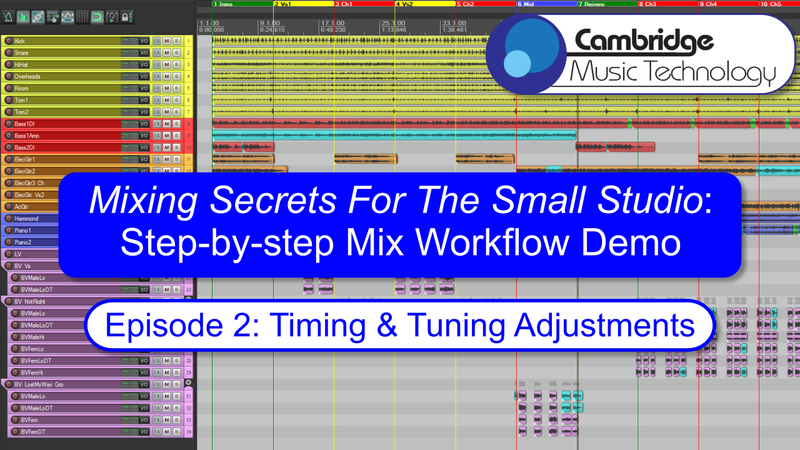 Tuning & Timing In Practice: Tuning and timing so regularly cause problems for home-brew mixes that I often talk about them in Mix Rescue. In this article, for example, there's a case-study of tuning a lead vocal in Melodyne, while this article and this article both talk about practical aspects of timing/groove adjustment.